The only great apes found in Asia, orangutans are found only in the lowland forests of Borneo and Sumatra in Southeast Asia. 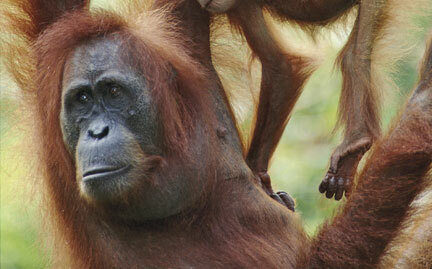 With 60 percent of their diet consisting of fruit, protection of orangutans’ habitat is vital. Sadly, the lowland forest habitats of these apes are disappearing quickly due to logging and deliberate burning to make way for agriculture and palm oil plantations.